As many of our patients know, orthotics are used as part of a treatment plan for numerous foot conditions. This is not due to orthotics being some sort of cure-all, but rather due to the fact that many chronic foot conditions are directly related to abnormal foot structure. Abnormal foot structure can mean flatter feet, higher arched feet, or feet where individual bones or groups of bones are structurally out of position from what is considered normal. Orthotics either realign the abnormal foot structure or stabilize it depending on the structural problem. We certainly don’t advocate orthotics for all foot problems, but when we do recommend their use it is important they be obtained and used properly. Orthotics are generally well tolerated by many people but can be initially a little uncomfortable in a small number of wearers. A break-in period can be helpful in easing one into their orthotics and allowing the foot to adjust to the new stabilization. 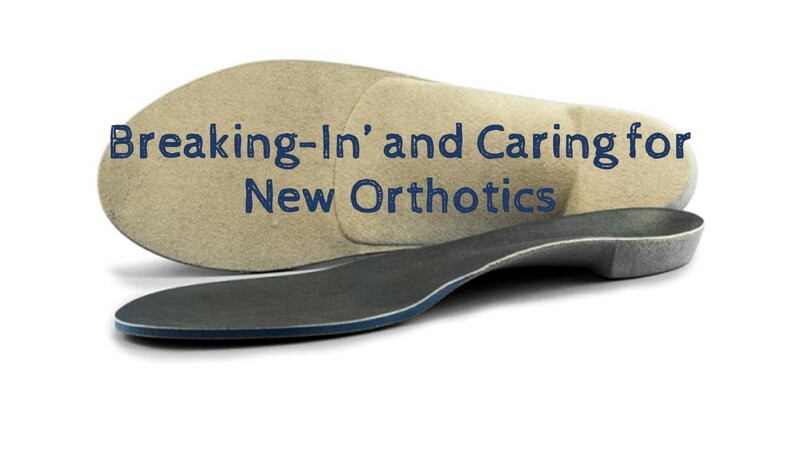 Once one receives their orthotics, the break-in period can begin and may last 2-3 weeks. There are two schools of thought on how to do this. The more rigid way involves wearing the orthotics for one hour the first day, two hours the second day, and so on. After about two weeks, one can wear the orthotics for a full fourteen-hour day without discomfort. The other way is a little more relaxed and involves wearing the orthotics until they become uncomfortable. The orthotics are either then removed from the shoes for a few hours, or for the rest of the day. This cycle of use and removal continues until the orthotics can be tolerated for the full day, which is usually about 2-3 weeks. Regardless of the technique, almost all wearers will become accustomed to and comfortable with their orthotics by that point. A very limited number of people will have no tolerance for an orthotic, and cannot wear them despite a break-in process. This is either due to a significant issue with the scanning or manufacturing process, to hypersensitivity to the bottom of the feet and irritation by anything touching the soles, or to foot deformity that is too severe for an orthotic to help. Caring for an orthotic is quite easy as most are maintenance-free. Soiling can be removed with hand washing, and if any top cover is present it can be air dried. Washing machines, dishwashers, and dryers will heat the orthotic and deform its thermoplastic material, losing correction in the process. They should be kept away from dogs and other animals that chew, as orthotics often resemble chew toys to animals. Orthotics can and should be switched from shoe to shoe, and one should take them along shoe shopping to ensure the orthotic fits in the new shoe. Poorly fitting shoes will always have fit issues with orthotics and often contribute to the foot condition as well regardless. For those that require their use, orthotics are a great way to reduce the mechanical conditions that lead to many forms of foot pain and can be tolerated by most everyone. Sometimes a little time is needed to attain full comfort, and sometimes one must give up bad shoe fit habits as well for them to work. If you have orthotics fabricated either by us or another doctor or lab and are having problems with comfort, be sure to give us a call and let us see what the problem is. Most of the time it simply requires an easy fix.